Home » Blog » Uncategorized » An IBS College Love Story? We all experience embarrassing moments and “Why me?” moments. 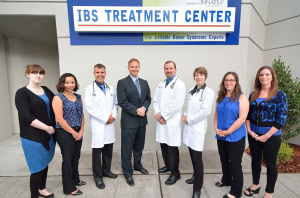 As doctors at the IBS Treatment Center, We’ve heard more than a few tales of unpleasant situations. Yet, there is one patient’s story that sticks out—not because of the embarrassing events, but because of the serendipitously happy outcome. Lindsay’s IBS story begins in high school. During those years, she passed off her discomfort as generic stomach pains that seemed to strike at random. Although her pain kept her home from school some days, she didn’t really mind missing classes in exchange for a day on the couch. And she certainly didn’t think her pain was a sign of anything serious because it passed after a day or so and only occurred every couple months. Everyone has unexplained stomach pains sometimes, right? That’s what her family doctor told her anyways. Then Lindsay moved away from home and into a college dorm where cafeteria meals and vending machine snacks replaced her Mom’s home cooking. She still had days when stomach pain prevented her from attending class, but it didn’t seem any more frequent than before. Besides, her change in diet could easily explain occasional bouts with digestive problems. But then things started to get more serious. Her stomach pains became more common and lasted longer than before. She often had to run to the bathroom with little warning, which was different from when she lived at home. Lindsay visited the campus medical clinic but the doctors there didn’t offer much helpful advice. They recommended she get more sleep and eat better. Severe IBS attacks always seem to happen at the most inconvenient times and places, don’t they? But we can’t think of much worse timing for a freshman than on a first date. Lindsay met Sam in their American Literary History class. When each student was asked to select a playwright to study, Sam and Lindsay both chose Eugene O’Neill. It wasn’t until the first semester came close to an end that Sam mustered up the courage to ask Lindsay out on a date. When he heard Strange Interlude would be performed at the local theater, it seemed like the perfect excuse. They went to dinner first at a Thai restaurant, a first for Lindsay. The atmosphere was perfect; the lights were dim, the music was upbeat, and the conversation flowed effortlessly. Lindsay felt particularly adventurous and ordered a dish she couldn’t even pronounce. It was a bit spicier than what she normally opted for, but it tasted good and she washed it down with plenty of water. While waiting for dessert to arrive, Lindsay’s stomach began to feel a bit “off.” She hoped it was butterflies or nerves, but feared it was due to the spicy dish. The butterfly sensation quickly progressed to mild cramps and she eventually had no choice but to excuse herself from the table. By the time she returned, Sam had already paid the bill and was outside anxiously waiting for her because they were now running late for the play. Once they arrived at the theater, they discovered almost everyone else was seated already, which meant they had to make their way to their seats (in the middle of the row, of course) by excusing themselves and apologizing the whole way. Lindsay still felt unwell. If she were back at her dorm, this would be one of those times when she wouldn’t stray too far from the washroom. But here she was, in the middle of a quiet theater on a first date with someone she found to be interesting, funny, and very kind. The curtains rose and the play began. Sweat began to form on Lindsay’s brow. Ten minutes into the first scene, Lindsay needed to use the bathroom again but remained in her chair trying to will away her cramps. Then came the gurgling noises. You know the ones we’re talking about. The loud noises that tell you and everyone around you that things inside are on the move. She could wait no longer. Lindsay told Sam she would be right back, stood up, and made her way down the row as fast as she could, apologizing again to each person she passed. She ran as fast as she could to the nearest bathroom where she stayed quite a while, sobbing with embarrassment until the emergency passed. When Lindsay emerged from the bathroom, it didn’t seem as though she could ever face Sam again. She slowly made her way towards the main doors of the theater with her head down. Stepping outside, the cool air felt nice on her skin and she looked up for the first time. Lindsay stopped dead in her tracks. Sam was standing there in front of her, looking concerned. “Are you ok?” he asked. She nodded as he took her hand. Sam hailed a cab and got into it with her, then asked the driver to take them to her dormitory. During the ride, Sam told Lindsay something that changed her life for the better.